A note on the box art, The Death of the Stag, a fine painting at the Scottish National Galleries (I saw it, an impressive painting indeed) on the right inner flap. A note about the Dalmore Custodians, their loyalty program on the left inner flap. 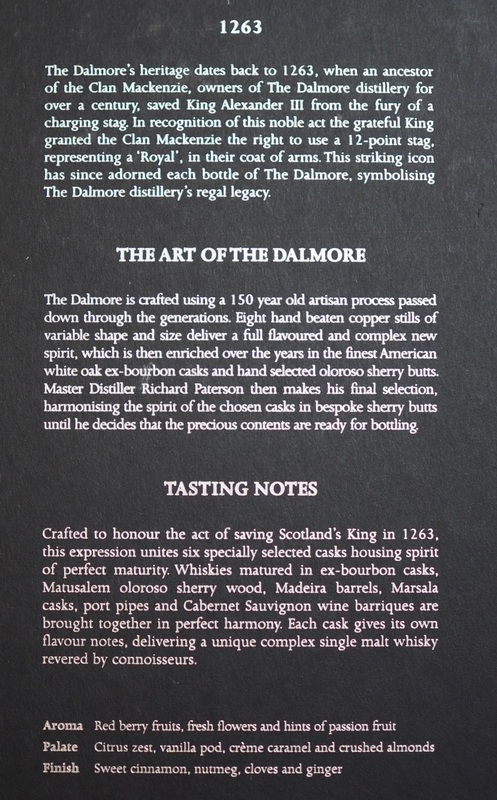 Dalmore history, Dalmore’s general approach to marrying spirit, and KA III tasting notes (box rear). 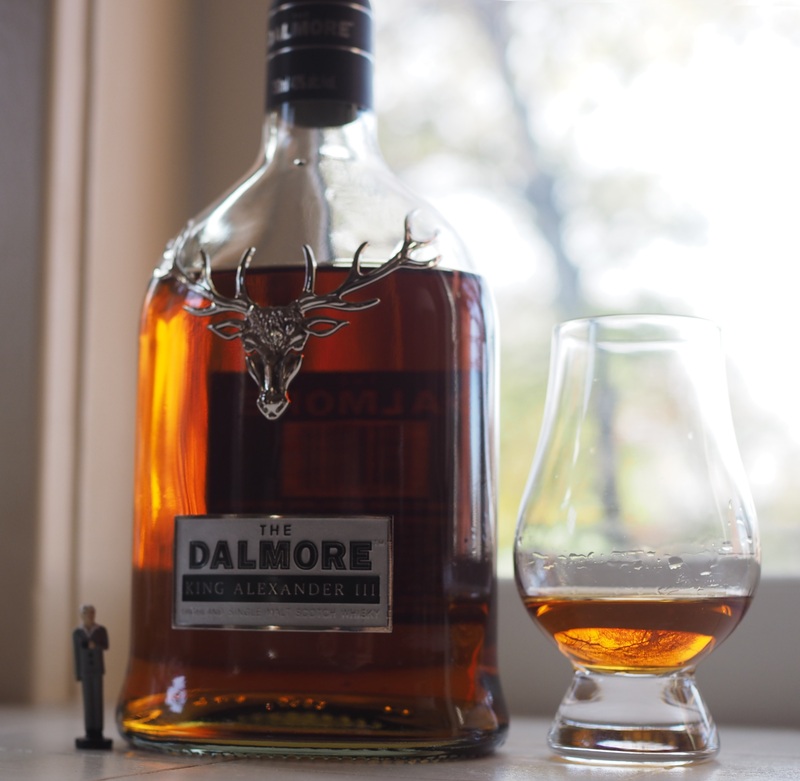 So what does Dalmore bring to the party? Does this hyped-up NAS hold up? That might have been an unfortunate comparison for the KA III. I didn’t think it unfair since the price of the thing was higher than the other offerings. Also, the contestants, including a couple from Speyside distilleries and a 24-year Bunnahabhain, were comparable in theme: no peat, some sherry caskings (especially in the Glenfarcas of course). I decided to give the KA III a second shot on its own, so on the day I shot the photos, I had my official tasting. It has been weeks since the first tasting and I’ve had nothing but a sip or two of the Bruichladdich besides my daily driver since then. No spoiler Bunna 24’s to sway my palate. How did it fare? Not weak, certainly. The KA III has some stuff going on, and one would expect a lot of flavor from the mad combination of barrels. As you may have read from the box photo above, that includes bourbon, oloroso sherry, Madeira, Marsala, port and Cabernet Sauvignon barrels! Wow. All those wine bottles do impart a deep ruby-mahogany color to the spirit, as you can see from the photos alongside. Also, with all those wine casks in the mix, we expect some fruitiness, and it has that. In fact, I think they went a bit overboard. When I finished my tasting notes (below) I tried to think of the overall impression. And I came up with this: the KA III is what Dr. Pepper soda would be if someone concocted an adult, 40-proof version of it. The flavor is sweet and fruity, fairly simple really, it has a liveliness reminiscent of carbonated soda and the finish is not overlong. I think the pop-oriented character is why, in our comparative tasting, the KA III did not fare well. All the other bottlings had distinctive characters and structure. I suspect they also had a lot longer in cask. We don’t know how long was the ‘perfect maturity’ of the casks that went into the KA III. I suspect from the slight leathery overtones there are some 14-year-ish sherry casks in the mix, but who knows. Nose: Fruit forward: prune, plum and cherry, with an undertone of mineral. Palate: Sweetly medicinal — chewy plum and prune hit first, then lively pepper tickles the tip and sides of the tongue, not unlike an soda pop or Listerine. The heavy sweetness gives way to a hint of tannins for balance, but this is not heavily structured. Finish: Moderate in length, leaving the aroma of Dr. Pepper mated with that peppery fizz feeling. There is a hint of older sherry butts — a leathery whiff that’s hard to catch. Bottom Line: I’m not against medicinal whiskies — one of my favorites, Talisker 10, has a notable medicinal quality as does Caol Isla’s standard, and I like that as well. The KA III, with all that heavy wine component, comes across to me as more medicine than whisky. I’ll keep this around for impressing folks who aren’t whisky drinkers, as I think it is approachable and it looks impressive — the bottle, the presentation case, as well as the dark color of the whisky itself. 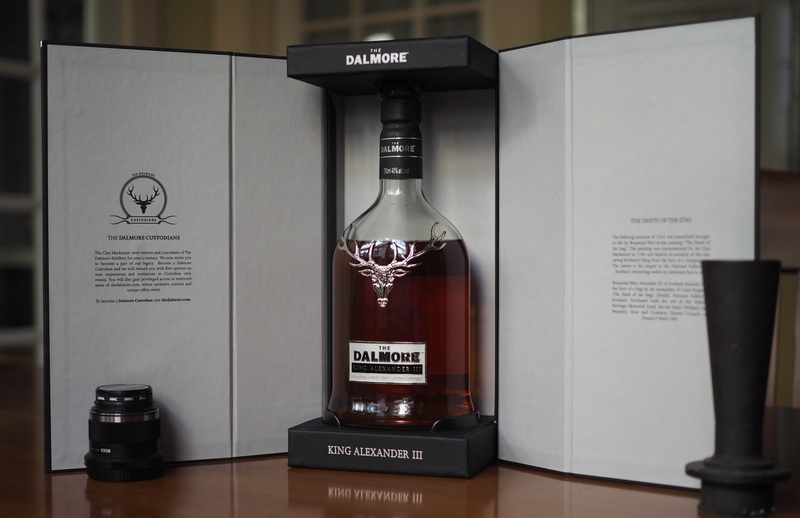 This entry was posted in Scotch-single malt, Whisky and tagged Dalmore, NAS, Scotch, single malt. Bookmark the permalink.